The BRK FG250B ionization smoke alarm is a great choice for a battery powered, smoke detection device in a mult-family home. The BRK FG250B smoke alarm is specifically designed for use in residential and institutional dwellings where hardwiring may be problematic or difficult. Compliant with UL217, CSFM, NFPA72, NFPA101 and other agencies. The FG250B comes equipped with a silence feature in the event of a false alarm. Should voltage drop below the sufficient level the horn will chirp approximately once per minute to indicate a fresh battery is needed. Ionization smoke detectors are typically more effective at detecting flaming fires. The FG250B smoke alarm includes a fully encased unit with insect screen to prevent insects from tampering with the ionization sensing chamber. Inside this unit is a 85db horn, a 9V battery power supply, a full function test switch, and a red led indicator light showing your detector is actively armed. The easy access battery compartment makes battery changing a snap, with the access door, you can change batteries without removing or un-mounting the unit. As the battery life fades, and the voltage level is below the required level, the alarm will chirp approximately one chirp per minute to indicate a new battery is needed. As a preventative, the battery door on the BRK FG250B will remain open unless a new battery is inserted. Purchased BRK FG250B because smoke alarms were needed in my home. Read the functionality and decided that the price point was competitive, and what it offered seemed to satisfy my need. 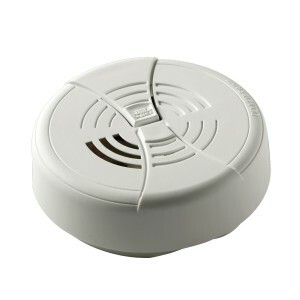 BRK FG250B is a very good smoke alarm. It is very sensitive but I would rather it be that way then not to be. It is easy to install. The fact that once it goes off, it may be silenced by the touch of a button, prevents having to remove the battery; and then having to remember to replace it! The alarm is piercing and loud enough to wake even a heavy sleeper; which is very important. All in all, I would have to say that this being my first experience with smoke alarm systems, I would purchase others (soon), and recommend them with confidence. Smoke alarms are now very expensive at Home Depot and even Walmart. This company saved the day with great prices and fast shipping!